Trail running is something that I have been looking forward to. 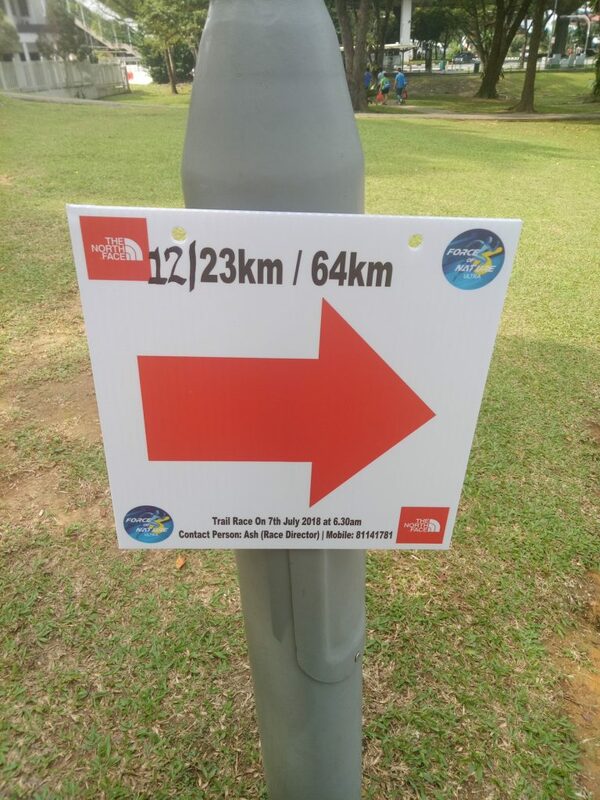 So I signed up for this 23KM at Force of Nature Ultra whose main sponsor is The North Face. It was organised by the same organiser as The Green Race last year. 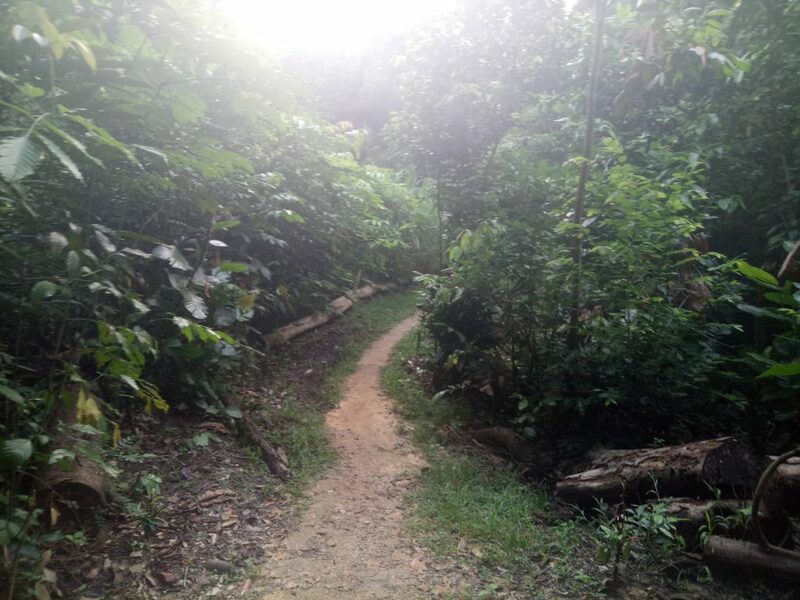 The main attraction of this event is the ultra distance race of 64KM, meant for the seasoned trail runners and the pain-seeking ultra runners. 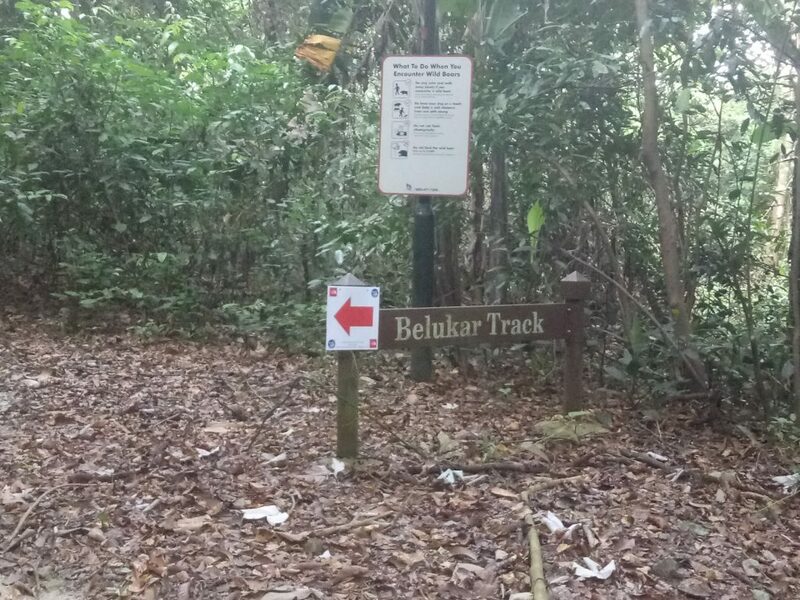 The 12KM is a less challenging distance for runners who just want to have a simple and fun run in the trail. 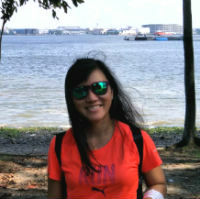 What I love about this trail race is that it starting off at Dairy Farm Nature Park and ending at MacRitchie Reservoir. It was an interesting route and one of the reasons I wanted to be part of it. Runners need to bring their own hydration systems as the race would not be providing disposable cups. This is to prevent littering in the forest. REPC was held outside The North Face Outdoor Training Station at Marina Square from 30th June – 1st July 2018. When I was there on the first day at around 2pm, there was no queue and no crowds. I was able to collect my race pack in less than 5 minutes. Race pack consists of one event tee-shirt, one GU energy gel, one box of BenBanter Low Carb Rosemary Seeded Crackers, bag tag and a few other promotional leaflets. The race bib has country flag and participant’s name printed on it. As I am still recovering from the harrowing foot injury, I was not sure if I could safely complete the race and not aggravate the injury. After some consideration, looking at the generous 6-hour cut off time, I decided to go ahead with the race despite the lack of training. Running on dirt paths is supposedly better compared to running on asphalt or pavement which are hard surfaces and punishing on my injured plantar fascia. When I arrived at Dairy Farm, the road side was very dark but upon walking into the slip road, there were lights and music. 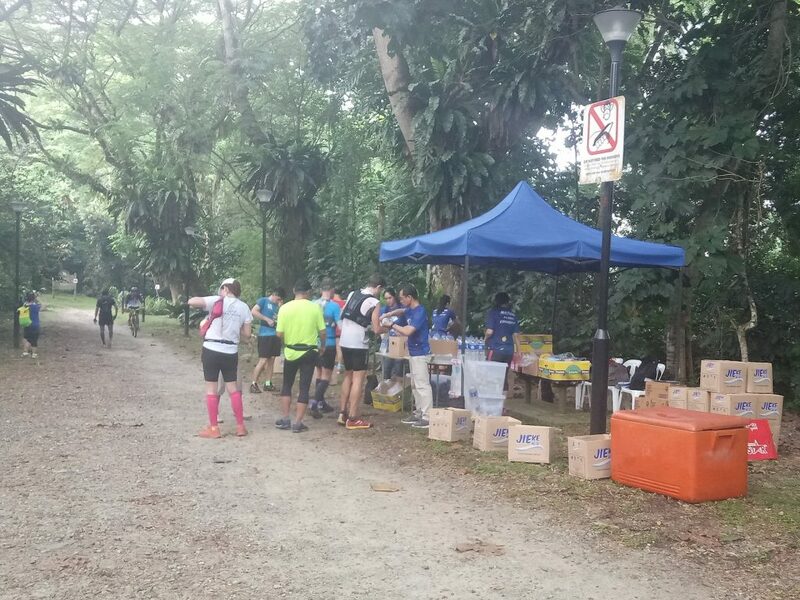 I deposited my bag at the white lorry stationed there, which would be transporting all the bags to MacRitchie Reservoir after all the runners had been flagged off. I spotted many international runners came from countries around the world. Flag off time for 23KM was at around 7:10 AM and 64KM was flagged off at around 7:00 AM. The announcement was made using a megaphone which was muffled and many participants could not really hear what was being said. Thus, some people missed the flag off and were late to start their run. 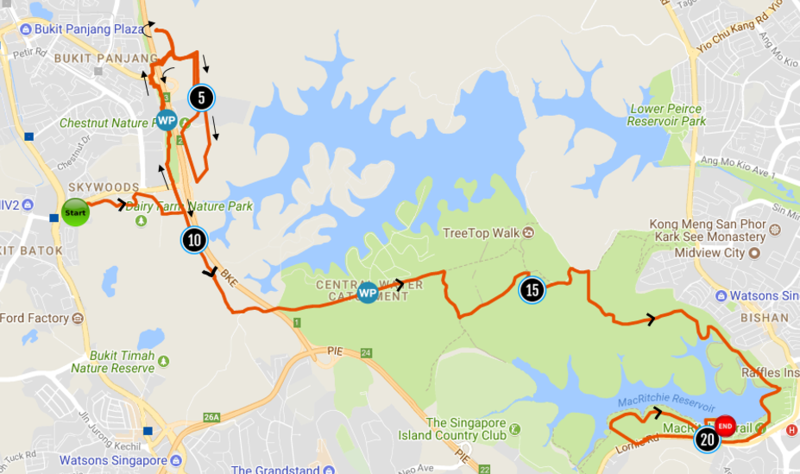 The race brought us from MOE Adventure Centre to Chestnut Nature Park through Zhenghua, turned back towards the technical trail deep in the Central Water Catchment, onwards into the cross-country trails in MacRitchie Reservoir Nature Park. The entire route involved all sorts of surfaces and terrains: dirts, rocks, sands, tree roots and mud. Up and down slopes were testing for the leg muscles. Some fast runners were running at breakneck pace and shouting loudly to ask other runners to keep to their left, probably chasing for a podium finish. Some runners were jogging leisurely and chit-chatting. I had to be mindful not to aggravate my injury and slowed down to a walk especially at the rocky and uneven terrains which were painful. I took an apple from the second water station and it was juicy and delicious. There were bananas and cookies as well. 1.5l bottles of water were seen on the table ready to be refilled into runners’ own hydration bag. I did not see any isotonic drinks. The directional markers were clear along the route, except for some forks where the markers were missing. I heard many runners were confused and marshals were not around. They had to ask strangers if anyone see any participants who were wearing the event tee running towards the direction either left or right. For me, I did not face any issues as marshals were still around to direct the way. I took an energy gel at around 11KM, but was soon feeling hungry again. I took a small Oreo cookie at one of the water stations and carried on. I didn’t need to refill my hydration bag as I still had more than enough water. 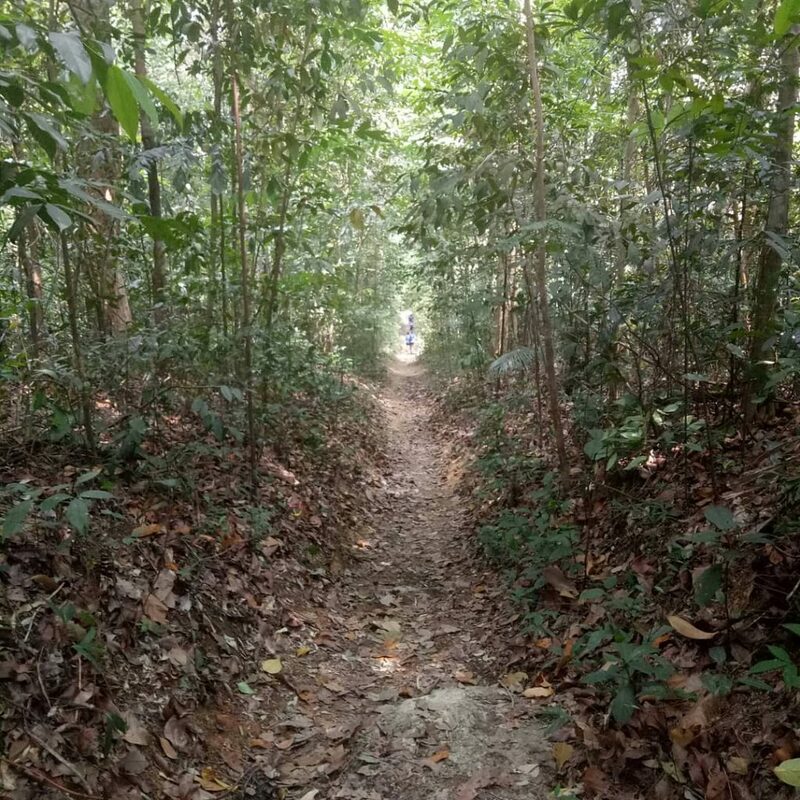 I was happy when I arrived at Sime Track as I knew I was finally in the Macritchie trail which is a familiar route. 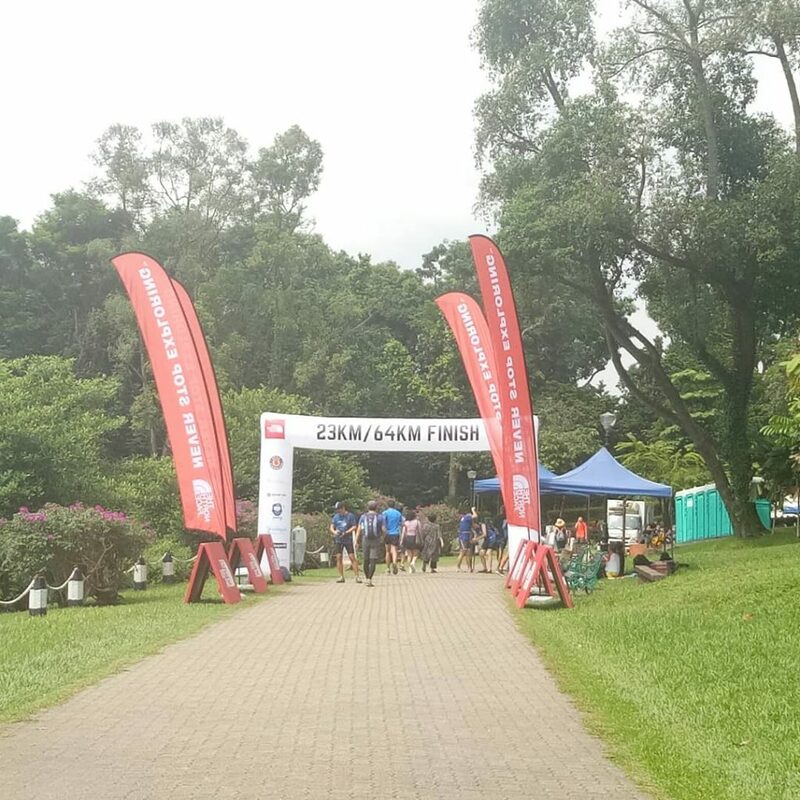 Upon exiting the MacRitchie trail towards the mushroom cafe, the finish arch could be seen but it was not the end yet. I glanced at my watch and the distance clocked was 20KM. I was aware that I needed another 3KM to complete the race. So I followed the signs and went upslope on the left. That dreaded segment felt like never ending and my feet were already screaming for me to stop. 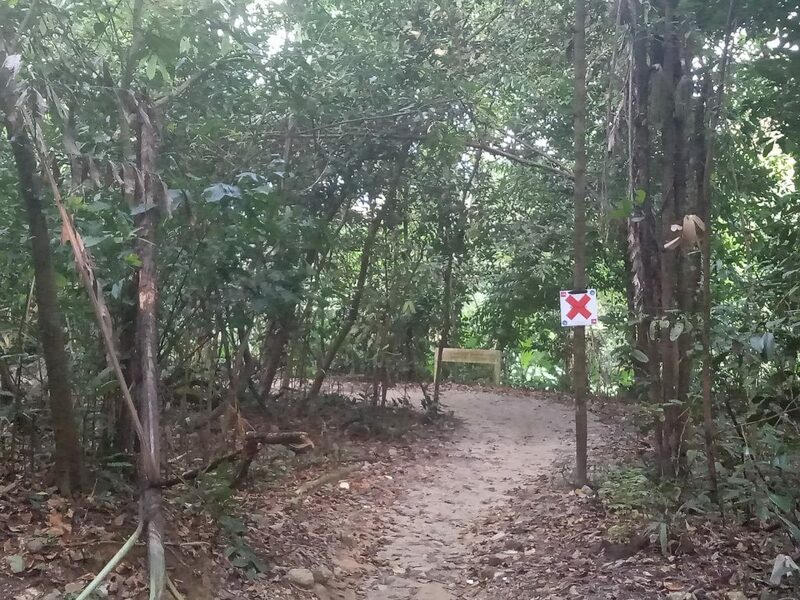 I struggled through it and felt relief when I saw the arrow pointing me into the trail on the right which apparently was the last stretch and would bring me to the finishing line. I crossed the line at 4 hour 25 minutes according to my Garmin, well within the cut off time and I was elated. After collecting my medal, I went to pick up another apple, custard cream cake and water. I saw my bag at the rack and went ahead to collect it. It was a nice Saturday morning well spent. The race was well organised but with some hiccups. I’d really prefer to have isotonic drinks at the hydration station rather than just water. The crew should make announcement using a good PA system to deliver messages rather than an unspeakable megaphone which failed. Oh, and I’d also prefer the medal to have distance engraved on it. Other than these, it was an enjoyable event for many trail lovers. Nature is a force, I conquered it. 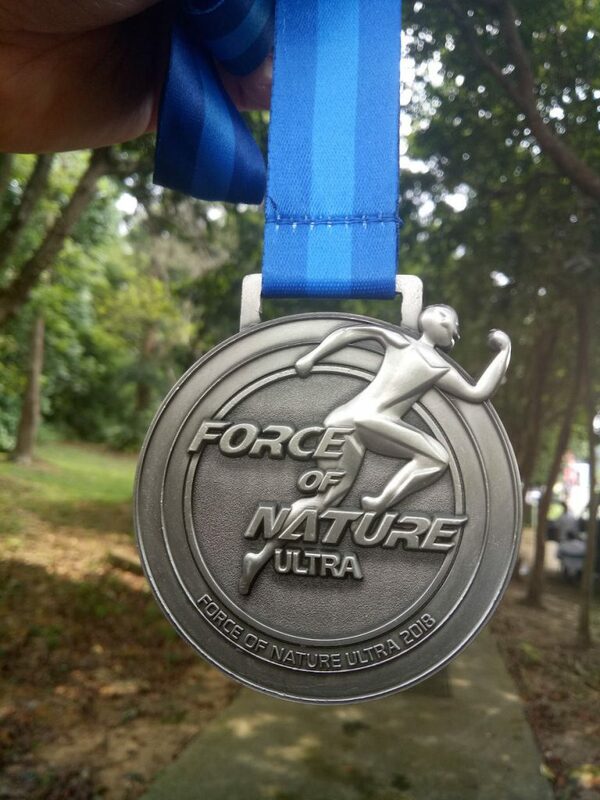 Thank you Force of Nature Ultra. Well done! Do rest well.